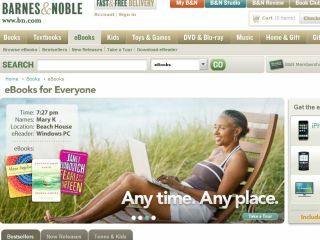 Barnes & Noble announced today the launch of the Barnes & Noble eBookstore, which it claims will be the largest ebook store, holding over 700,000 titles. The company also said that it would be the exclusive ebook retailer on board the widely anticipated 3G, touchscreen Plastic Logic eReader device, due for release early next year. Of the 700,000 titles at launch, more than half a million come from Google's catalogue of public domain books - which puts Barnes & Noble somewhat behind the Amazon Kindle's 300,000 in-print titles. The store, which opens initially in the US only, allows customers to buy eBooks (in the common epub format, with DRM) and read them on a wide range of platforms, including the iPhone and iPod touch and BlackBerry smartphones via dedicated apps, as well as most Windows and Mac computers. The iPhone/iPod Touch app is currently the leading downloaded book app in Apple's App Store. In addition to enabling customers to easily place orders for books, movies, and CDs, it allows users to snap a photo of a book's front cover using the iPhone's camera and within seconds get product details, editorial reviews, and customer ratings – or even find and reserve a copy in the nearest store. The app also includes a store locator, bestseller lists, book recommendations, and a store events calendar. In addition, Barnes & Noble announced a "strategic commerce and content partnership with Plastic Logic", whose eReader device is especially designed for "business professionals" (which may give some indication of its possible price. as yet unannounced). Barnes & Noble will exclusively "power" the eBookstore for the Plastic Logic eReader device. A Barnes & Noble spokesman said, "We've had a great reception from publishers, who are rallying behind digital." This despite promising best-selling new releases at $9.99 (£6) like the Kindle, a move that has seen Amazon heavily criticised by some US publishers. You can check out the new ebookstore at www.bn.com/ebooks.